Oligodendrocyte is any of the neuroglial cells of the central nervous system that are responsible for the formation of myelin sheaths in the white matter and that, in the gray matter, is detectable using myelin staining techniques and may provide support for adjacent neurons. 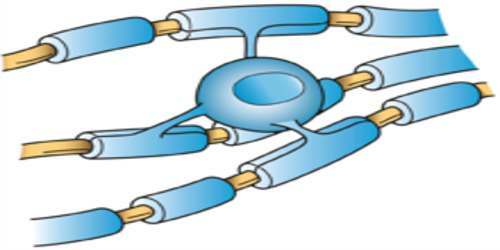 The oligodendrocytes surround and insulate the long fibers (axons) through which the nerves send electrical messages. Oligodendrocytes are subdivided into interfascicular and perineuronal types and have few cytoplasmic fibrils but a well-developed Golgi apparatus. 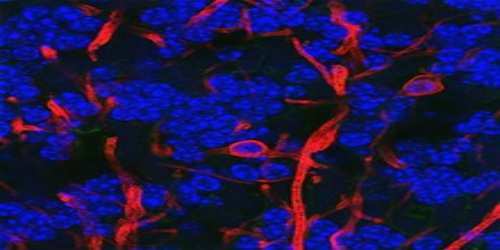 They can be distinguished from the type of neuroglia known as an astrocyte by the greater density of both the cytoplasm and the nucleus, the absence of fibrils and of glycogen in the cytoplasm, and large numbers of microtubules in the processes. Interfascicular oligodendrocytes are aligned in rows between the nerve fibres of the white matter of the central nervous system. In gray matter, perineuronal oligodendrocytes are located in close proximity to the somata of neurons. In the peripheral nervous system, neuroglias that are equivalent to oligodendrocytes are called Schwann cells. There are differences in myelin formation differences in CNS (brain, spinal cord) and in peripheral nervous system (cranial nerves, peripheral nerves). Oligodendrocytes are closely related to nerve cells, and, like all other glial cells, oligodendrocytes provide a supporting role for neurons as well as trophic support by the production of glial cell line-derived neurotrophic factor (GDNF), brain-derived neurotrophic factor (BDNF), or insulin-like growth factor-1 (IGF-1). 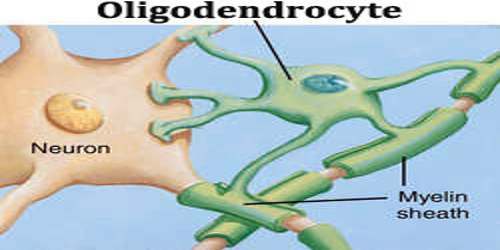 Oligodendrocytes swell in response to almost any type of toxic or metabolic change. 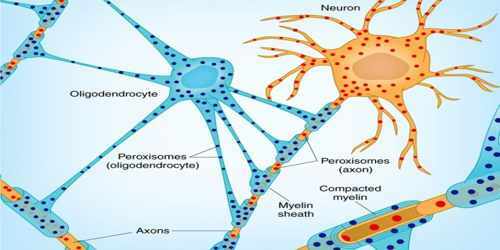 Diseases with primary involvement of oligodendrocytes result in disorders of myelin, with demyelination or abnormal myelin formation. The two major groups of diseases affecting oligodendrocytes and myelin are the leukodystrophies, which include inherited disorders of myelin metabolism, and the acquired demyelinating diseases.